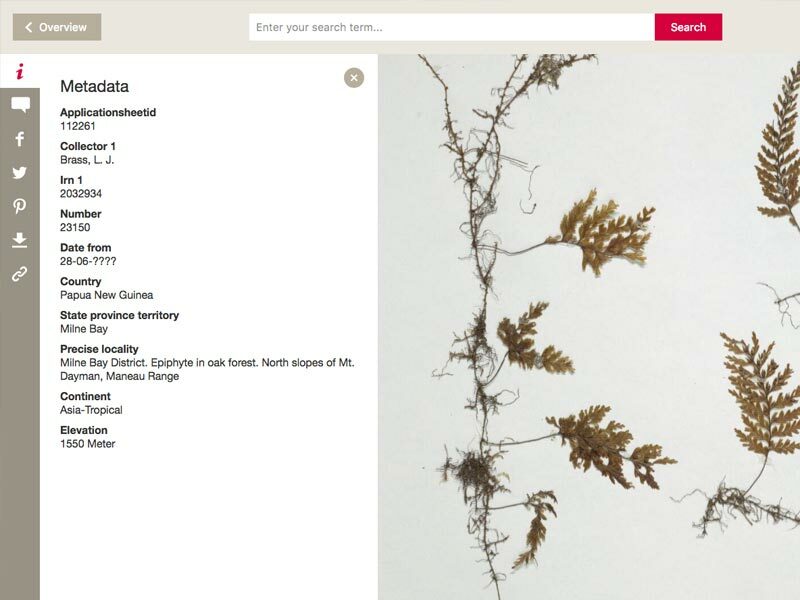 Having processed almost 10 million herbarium sheets today, Picturae has approximately doubled the number of herbarium sheet images available world-wide in 3 years time, and we are ready for the challenge ahead! 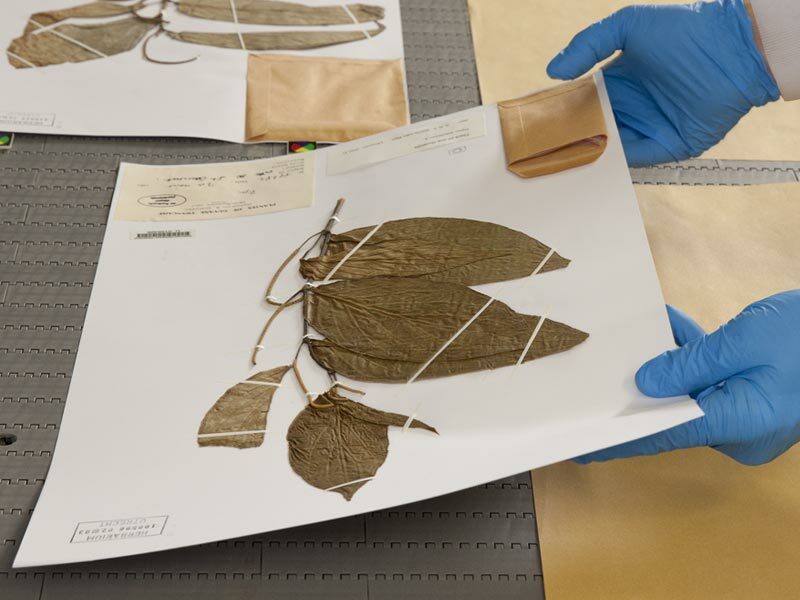 It’s estimated there are well over 350 million herbarium sheets in the world and that number is growing by the day. We are determined to see it all digitized in our lifetime, how about you? 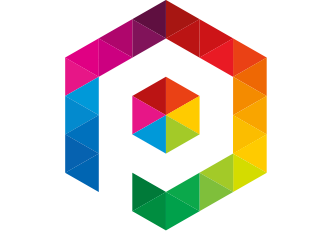 Picturae is probably the most innovative company in the world of digitization unique cultural heritage objects and delicate natural history specimen. Trough the years we have developed several methods, software and workflows to ensure the best possible product for our clients. 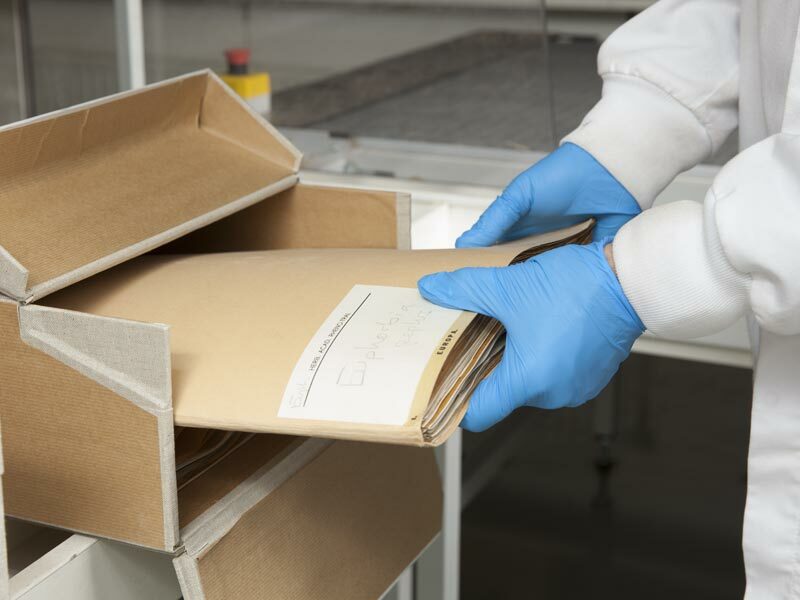 Due to the relative uniform herbarium sheet collections we have been able to develop our state-of-the-art conveyor belt solution. 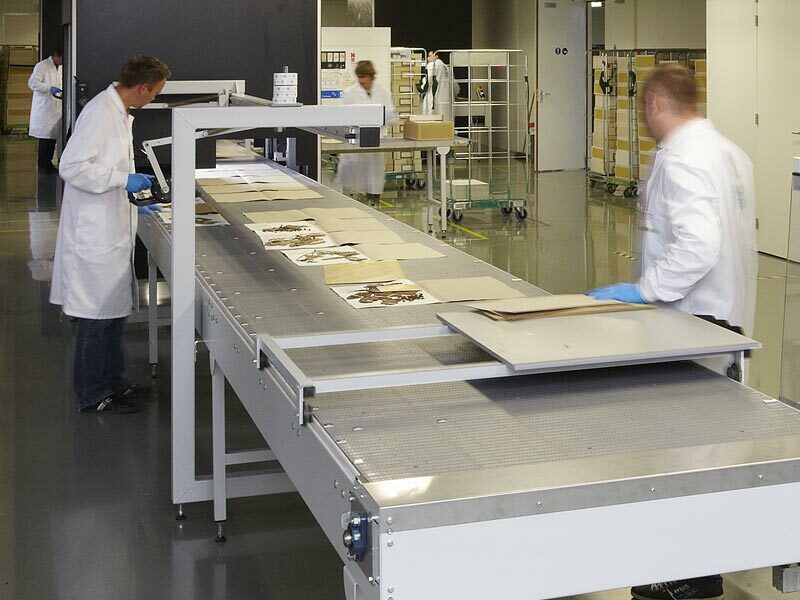 Our herbarium conveyer belt operates completely mechanically, controlled by our own software. Therefore the image capturing process has become completely automated. 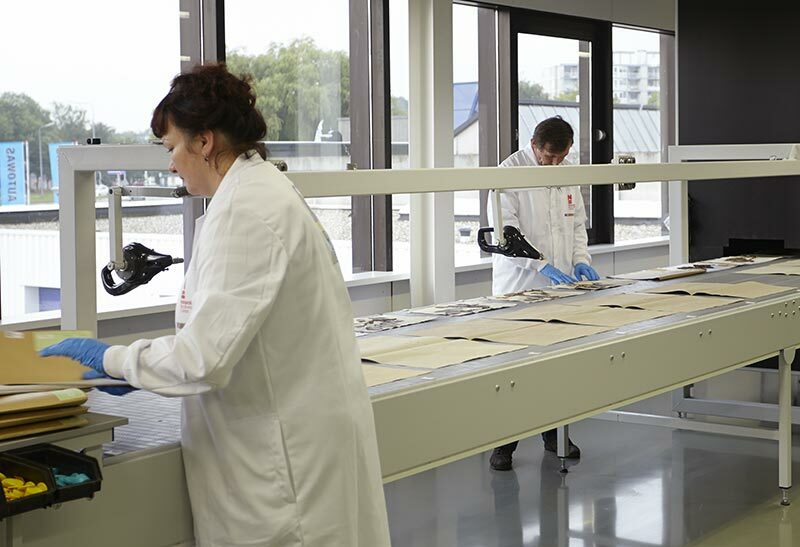 Staff can solely focus on carefully handling the specimen, barcoding and repacking the sheets after processing. 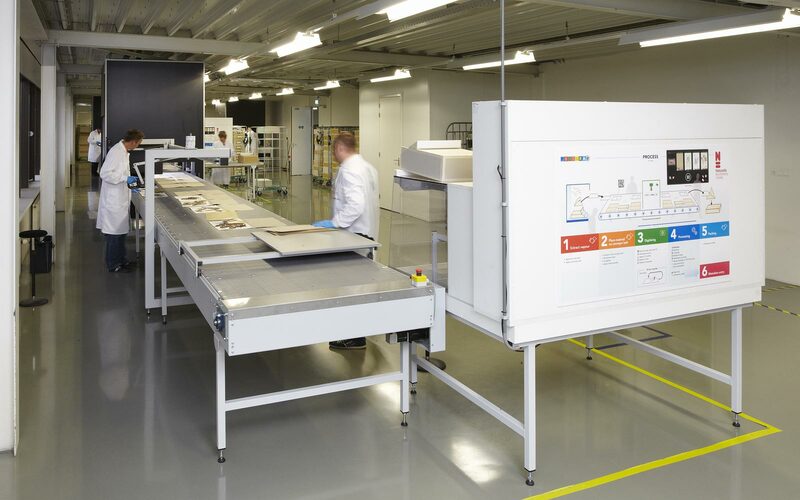 Each image will be validated according the required quality standard and errors are automatically detected before it reaches the conveyor belt’s end. With imaging speeds up to 6000 specimens a day, an average of only three staff members are needed. 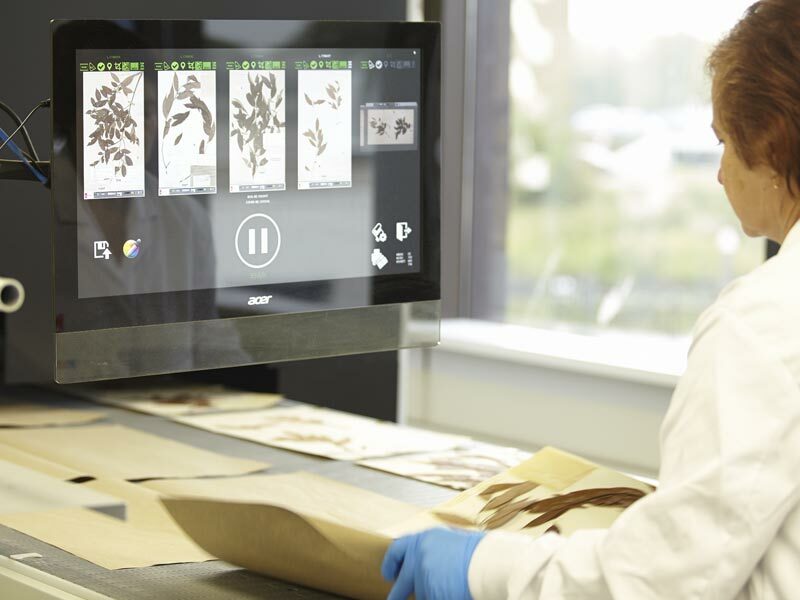 This makes the Picturae herbarium conveyor belt the ideal solution for biodiversity and botanical (research) institutes. 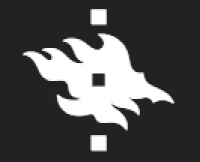 Our solution focuses on meeting and applying the seven project objectives: quickest processes, optimal safety in handling original specimens, highest quality standard for reproductions, atomization of our processes, validation of the output, minimizing error correction processes and best aid with big data. Specially engineered lighting gives a perfect 3D-like image. High grade lenses capture the finest specimen details in resolutions up to 600ppi. 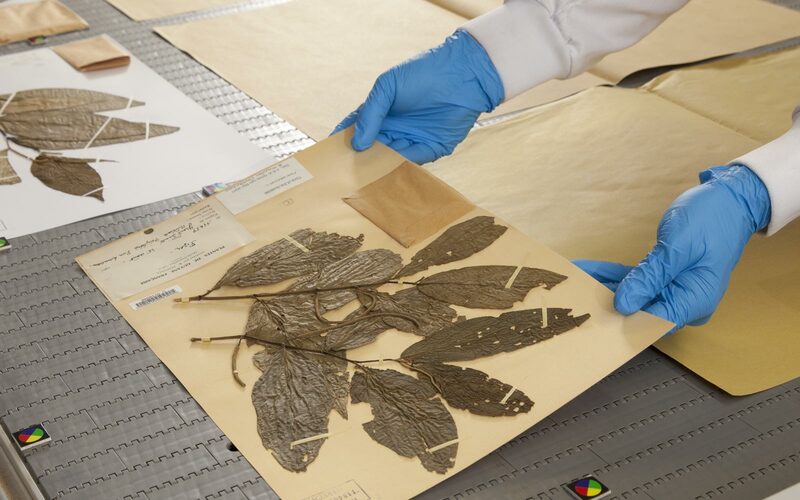 Perfectly reliable due to our experience with millions of specimen labels, following proven protocols with use of historic information and look-up tables like the Plant List. Extremely accurate, professional and quick: our craftsmen secure your specimen and labels for the far future. And like all our services: anywhere in the world. Moving delicate specimen in big quantities requires skill, structure and oversight. Insurance, regulations, weather and bugs all need to be dealt with properly. Online, open source, exchange, archival standards, crowd sourcing, responsive design, use friendliness, merging databases, flexible, scalable: what can we help you with? Our systems serve over 50 million images from 2PB of secured data through industry grade search technology. Ready for both the botanist in the field and Big Data analysis at the office. 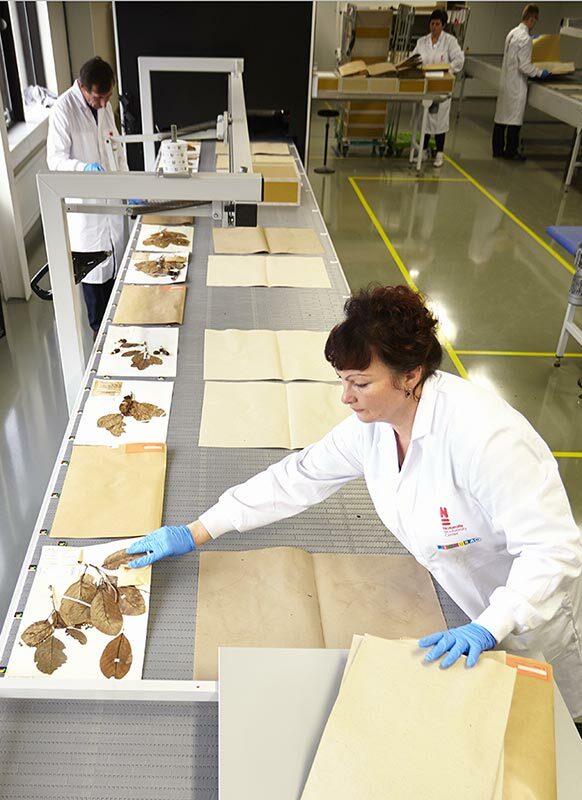 Picturae has created a special digitisation system to digitise herbarium sheets. On 5-6 March 2018 you can find us at the ICEDIG opening conference in Helsinki Finland. For more information see cetaf.org. 3rd Con­fer­ence, in Helsinki Finland. For more information see DHN 2018. Come and meet us at the 8th European Botanic Gardens Congress in Lisbon Portugal at 7-11 may 2018. 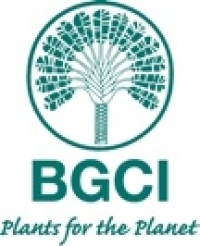 For more information see bgci.org. We will be attending the Botany 2018 conference in Rochester, Minnesota (USA) on 21 - 25 July. For more info see botany.org. Come and see us at the SPNHC 2018 Joint Meeting with TDWG on 25 august till 1 september 2018 in Dunedin, New Zealand. For more info see spnhc.org. 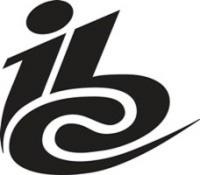 We will be attending the IBC 2018 in Amsterdam 13-18 September 2018. For more info see show.ibc.org. We hope to see you there! From analogue to digital? We offer a wide range of digitizing solution for 2D material. Ranging from glass negatives to posters, extra large material, special collection books and microfilm. Contact us for more information or visit our website. World Class Rapid Digitization of Cultural Heritage. Picturae offers on- and offline file & collection management solutions. Additionally we offer a wide range of web-based products such as websites portfolio and platform. With our professional software you can bring your digital collection to the next level. Contact us for more information or visit our website. Sharing ideas, enriching your cultural heritage. From analogue to digital? We offer a wide range of digitizing solution for Audio-Visual material. Ranging from 8mm film to BetaCam, VHS and LP’s. With our professional AV studio’s we can save your precious and valuable collection. Contact us for more information or visit our website. From analogue to digital? We offer a wide range of digitizing solution for 2D material. Ranging from glass negatives to posters, extra large material, special collection books and microfilm. Contact us for more information or visit our website. Picturae offers on- and offline file & collection management solutions. Additionally we offer a wide range of web-based products such as websites portfolio and platform. With our professional software you can bring your digital collection to the next level. From analogue to digital? We offer a wide range of digitizing solution for Audio-Visual material. Ranging from 8mm film to BetaCam, VHS and LP’s. With our professional AV studio’s we can save your precious and valuable collection.